Buy local at the Saratoga Farmers' Market! Open year round, the Saratoga Farmers' Market brings fresh, delicious food to the Spa City so you can enjoy a taste of the good life from local growers every season. Remember, when you buy local at the Saratoga Farmers' Market, you are investing in organic produce and other products that only travel a short distance to your home. That means there is less of a carbon footprint being placed on the earth (not to mention it's an investment in the local economy). Want to get a fresh taste of Saratoga this season? 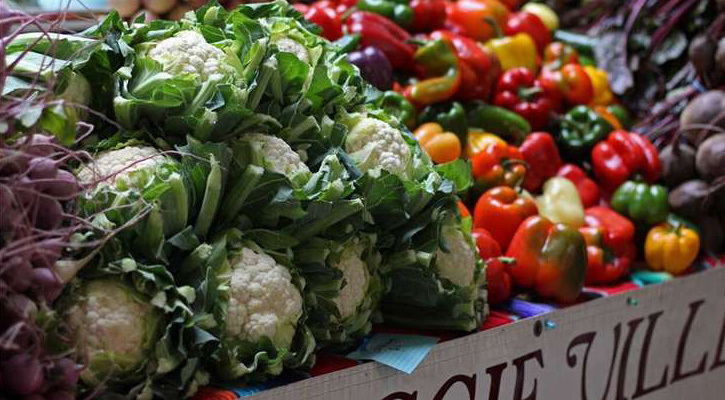 Discover the variety of choices at the Saratoga Farmers' Market! Fresh greens, breads, and other goodies are available year round. Local vendors offer rich cheeses, juicy organic fruits, fresh veggies, sweet jams, creamy yogurts, baked breads, pizza, berries, maple syrup, meats, herbs, honey, and so much more! Choose from about 40 outside vendors and 25 indoor vendors to find everything you need to prepare the most delicious meals (and midnight snacks) in Saratoga. You can also buy other local products such as soap, sewing crafts, home-spun wool, and more at the Saratoga Farmers' Market. Live music and freshly brewed coffee add an even sweeter touch to your local shopping experience. Visit the Saratoga Farmers' Market and see for yourself! The FreshFoodNY app allows shoppers to place their farmers' market orders in advance, thereby ensuring that desired products are available when they arrive at the market. To take advantage of FreshFoodNY, simply download the free app onto your iOS or Android device, search for your favorite vendors, and make your selection from the available items. Once your "cart" is full, make your payment and select a pick-up time. Nearly a dozen Saratoga Farmers' Market vendors are already using the app, with more sure to follow!